Headed into NHL game-day #82, media outlets around Montreal published the latest Eastern Conference standings with the letter “é” next to the Montreal Canadiens’ rankings. The team was locked to finish the regular season in ninth place, officially eliminated from the postseason. “The mood in the dressing room this morning was of disappointment,” admitted head coach Claude Julien in his post-game press conference hosted on the Montreal Canadiens’ official facebook page. Julien opted to rest a few regulars on a night that wouldn’t change the team’s fate, allowing prospect Ryan Poehling to make his NHL debut. Poehling signed an entry-level contract earlier in the week, and while the mood around town was somber, it was a great opportunity to get the rookie some ice time against the Toronto Maple Leafs, one of the team’s most storied rivals. Over the last two seasons the Leafs have won seven straight games versus the Habs, including the season opener after Auston Matthews scored an overtime winner. In their last matchup, the Habs came close to joining their rivals in the standings but squandered a 3-0 first period lead and lost 6-3. The mood was bleak around Montreal as the Leafs pulled away and secured the third seed in the Atlantic Division. 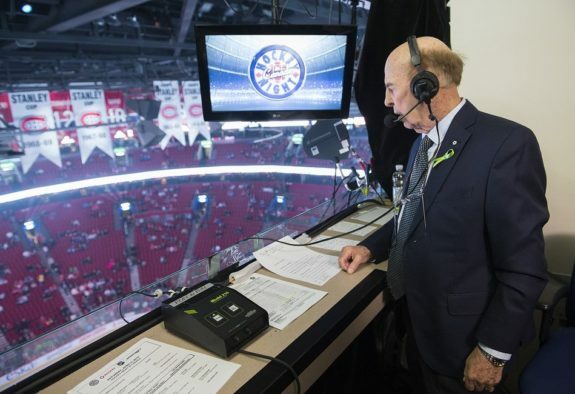 Although game #82 had no influence in the standings, a sub-story helped this virtually meaningless game become an instant classic; it was Hockey Night in Canada play-by-play announcer Bob Cole’s last game on the mic after an illustrious 50-year career. The Leafs came out of the gate flying, scoring the game’s first two goals. But the tempo shifted halfway through the first period when Poehling tipped in a pass while being driven through the crease by opposing fourth line centreman Frederik Gauthier. The Leafs’ bench called for a goaltender interference challenge but the goal was upheld. Poehling, an NCAA star a week prior, had just scored his first goal in his professional debut. And he was far from done. In his first shift of the second period, Poehling found himself alone in front of the net, again, as Jeff Petry rang a slapshot off the right post behind Frederik Andersen. Unchallenged, Poehling buried the puck into the open net and the game was tied. Late in the third, the Habs down by one, and fans hoping for more of Bob Cole’s calls, Petry broke out from deep behind the Habs net. He found a checked Andrew Shaw who redirected the pass to Artturi Lehkonen while shifting the defence over to the corner and sprung Poehling to the low slot. Poehling flashed his skill by snapping a hard shot over Andersen’s blocker, tying the game at five with 2:35 to go. He was the first Montreal Canadien to score a hat trick in his professional debut since Alexander Smart did so in 1943. After overtime solved nothing, Julien opted with a usual lineup of Habs’ snipers for the first three rounds of the shootout: Tomas Tatar, Jonathan Drouin and Jordan Weal, who managed to score a goal to match the Leafs’ one goal. In round 4, Julien went with the hot hand in Poehling, and he responded by getting Andersen to commit to a low blocker side shot, while he snapped the puck into the opposite top corner. “What an unbelievable start to a career,” was ironically the last goal-call of Bob Cole’s career. 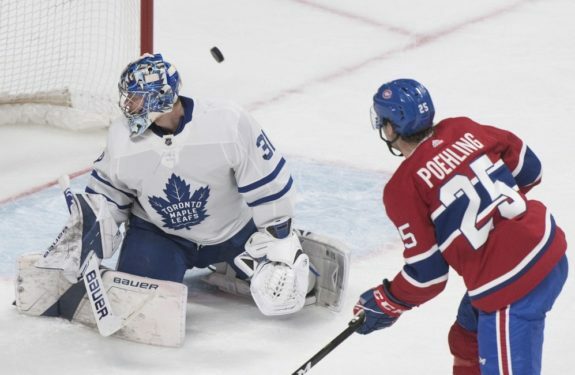 Charlie Lindgren, who made his first Montreal Canadiens appearance of the season sealed the win by stopping Kasperi Kapanen, the Leaf’s fourth and final shooter. As the victory horn went off, a stream of Habs flooded Poehling on the bench instead of skating out to Lindgren. “We’re all just in shock, I don’t know what to think right now, it feels like a dream, I don’t know what to do,” an overwhelmed Poehling stammered through his post-game media scrum featured in a report by RDS reporter Luc Gélinas. By the end, the game had four-lead changes and three injury stoppages, none serious enough to force anybody from play. The teams came to play on game-day 82, just as Mr. Cole mentioned when he opened the show. But most importantly, what was supposed to be a funeral for the season quickly became a coming-out party for the future. The Habs may have finally found the elusive power-forward centre they’ve been searching for over the course of two decades.